The only genuine British Spectrum clone, the SAM Coupé is perhaps best regarded as an interesting failure. Ironically, the machine was a failure precisely because it was a Spectrum clone, or more accurately a Spectrum-compatible: it became seen as merely a souped-up Spectrum, an unattractive proposition at a time when the market was becoming dominated by 16-bit computers and consoles. It also suffered badly from a series of technical problems and poor business decisions by its manufacturers. The SAM Coupé was produced by Miles Gordon Technology (MGT), a long-established Spectrum peripherals supplier notable for producing the excellent Plus D and DiSCiple floppy disk interfaces for the Spectrum. The concept was not dissimilar to that of the never-released Sinclair Loki - an 8-bit computer with 16-bit features. It had a fairly impressive hardware specification for the time. [spec] On top of this, it was quite compatible with the Spectrum, so could be used with a large number of existing programs (although they could not, of course, take advantage of the advanced features). However, the machine had the major disadvantage of not initially having a floppy disk drive. This made for unfavourable comparisons between the SAM Coupé and the 16-bit machines, which enjoyed quick or instantaneous loading times (in the case of the consoles). MGT did produce a floppy disk drive in response to public demand but, disastrously, it was discovered that the ROM routines dealing with disk operations were faulty. The company consequently had to produce a new ROM to fix the bug. Sales of the SAM Coupé were poor from the start and the subsequent problems made matters worse; MGT went into liquidation during the recession of 1990. The founders of MGT, Allan Miles and Bruce Gordon, did not give up on the SAM Coupé after the collapse of their company and bought back the rights to the machine. 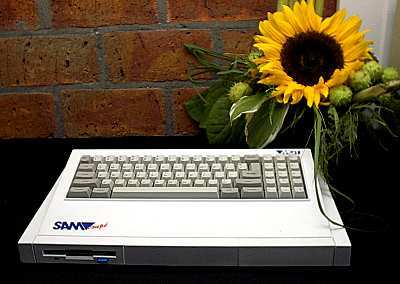 Under a new name, SAM Computers Ltd (or SAMCo for short), the pair began to manufacture the machine again and released numerous games and hardware add-ons. Unfortunately they ran into financial difficulties again and SAMCo went into liquidation in September 1992. The tangled story of the SAM Coupé entered one final chapter in April 1993, when it was announced that a company called West Coast Computers had bought the rights to the machine. As it happened, that was the last that anyone heard of West Coast and the SAM Coupé finally sank into obscurity.